What is Color? This seems like a silly question. We are all familiar with colors and have been taught about them since kindergarten. But chances are that unless you have studied the physics of light you will be hard pressed to provide a concise description of what a color is. You probably remember there being some set of primary colors (there were three, right? ), and that they mix to form other colors. But that is not really a definition, and it leads to some open questions. Like, is black a color? Ask this to a group of people at your next social gathering and you are likely to get disagreements on the answer. (I’m sure discourses on color will be considered fascinating in your social circle.) Later I answer this question definitively (at least as far as I define color), but first let us get a better understanding of the physiology of sight and color. Anyone with eyelids is aware that our sight is based on the sensing of our eyes. Vision comes from electromagnetic radiation entering through a hole in the front of our eye called a pupil, being refracted by a lens behind that and focused on the back of the eye called a retina. Electromagnetic radiation is characterized by a property called wavelength. Electromagnetic radiation of different wavelengths has all sorts of useful properties. We use waves of about 1 m to transmit radio and TV signals. Microwave ovens use waves of about 1 cm to cook our food. X-rays, at about 1 nm, can penetrate our bodies and can be used to take pictures of our insides. High energy gamma-rays of about 0.01 nm are particularly good at killing us. It turns out that our eye can only sense these waves of radiation with wavelengths between about 400 nm and 700 nm. This type of electromagnetic radiation we call “visible light” (or simply “light” if you are not insanely pedantic). As we look at light from different wavelengths, we will observe they they are of different colors. (The pure wavelength colors are by no coincidence the same colors as a rainbow.) So, clearly, color has something to do with the wavelength of light. Our sense of color comes from how different types of light receptors in the eye activate differently based on the wavelength of light. In your retina there are two major types of light receptors called rods and cones, named after their shape under a microscope. I won’t discuss the rod type receptor here because it is really only used to sense low levels of light and does not contribute to color perception at all. It is the cones that differentiate light wavelengths into color. Normalized typical response of cone receptors to different wavelengths of light. Image courtesy of Vanessa Ezekowitz. There are three types of cone receptors. The short-wavelength cones are most sensitive to blue light; the middle-wavelength cones are most sensitive to green light; and the long-wavelength cones are most sensitive to greenish yellow. The response of each of these to different wavelengths of light is shown at right. Don’t worry about making too much sense of this plot. It won’t be on the quiz. The fact that we have exactly three types of cones is very important. It means that using only three colors of light, we can mix them together in different ways to replicate any discernable color. This property is known as the trichromatic theory. It is this trichromatic property that makes color TVs, monitors, cameras, and pictures possible. It is not feasible to capture and display every possible wavelength of light, but we only need three. The colors we typically use to capture light are red, green, and blue. Consider the combinations of red, green, and blue light of different brightness. Each combination results in a different color. We can think of all these colors existing in a 3D space such as the one shown here. Now that we know how the different wavelengths of light cause us to see different colors, we know all there is to know about generating color, right? Well, no, not quite. So far I have talked about colors exclusively by their physical properties. However, we will find that the relationship between the physical properties of colors is not a good indicator of the relationship in our perception. To demonstrate this difference, I particularly like the color survey performed by Randall Munroe. A former NASA roboticist, Munroe is most well known for his xkcd internet comic. For some time in 2010 Munroe placed on his popular web site a survey form presenting volunteers with random colors and asked them to type whatever name they thought best fit each color. 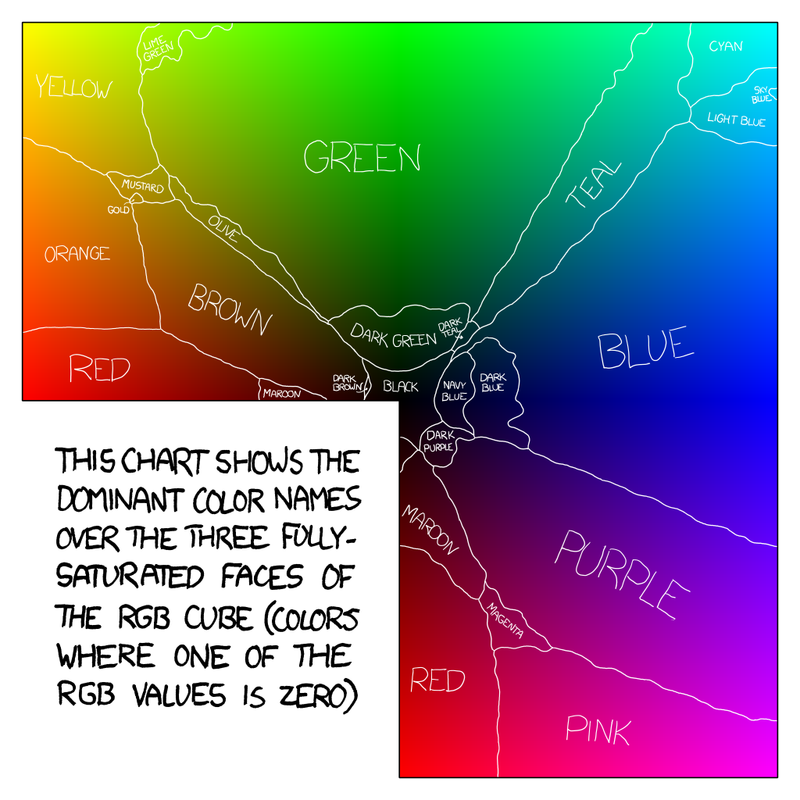 After some conditioning, here is a map of how people perceive saturated colors. What is interesting about this diagram is that the regions representing different colors have very different sizes. Although yellow is a very recognizable and distinct color, it is contained in a fairly small region of light. The region for cyan is so tiny that it’s hardly ever mentioned as a color of the rainbow even though there it is, wedged between green and blue. In contrast, the size of green is huge. In the spectrum of all visible light, roughly 1/8th of it looks to be green. (I come to this 1/8th figure using the sound scientific method of visually making a rough estimate then confidently stating the figure in a non-peer-reviewed blog with no proper justification.) In fact, in many of the snarky comments posted in place of proper colors in the study, subjects indirectly commented on that fact that the random colors came up green surprisingly often. Here are some of the more overt (and humorous) remarks. jesus christ what is with you and green? The point is that if you are going to use color in a practical sense, whether it be drawing a picture for Facebook or demonstrating de novo chromosome formations, it is important to understand the effect of mixing colors is highly nonuniform. For example, if you start with a pure green light and add a bit of red light, it will still look green. The color will continue to look green until you have almost as much red light as you do green. But if you start with a pure red light, you don’t have to add much green to make the color look orange. So although trichromatic theory and primary colors do a good job telling us how to make colors, it does not do a good job modeling how we interpret colors. The only reason why you know that “yellow and blue make green” is that you memorized it after mixing those finger paints when you were 5. If you thought that the physical definition of color was complicated, that is nothing compared to the messy process of defining a perceptual basis for color. Consequently, I’m going to skip over the details (much if which I only have a tenuous understanding anyway). Instead, I am going to suggest that a more natural way to describe color is by its properties of hue, saturation, and brightness. Hue, saturation, and brightness. © Commonwealth of Australia | Licensed under Creative Commons Attribution-ShareAlike 3.0 Australia License. The brightness property is self explanatory. It refers to the overall intensity of the light. The hue property refers to the dominant wavelength. Remember that each wavelength corresponds to one of the colors of the rainbow. The saturation refers to how dominant the hue is. Full saturation represents a pure rainbow color. Lower saturation means the color becomes washed out. No saturation means the light is some shade of gray (ranging from black to white). A black-and-white photograph has no saturation. An interesting feature of the hue, saturation, and brightness dimensions is that the hue and saturation form polar coordinates. The hue is measured in degrees and is a continuous circle. The saturation is the radius of this circle. When the saturation is zero, the hue does not matter. Thus, the brightness axis is a singularity in the visual system where changes in hue make no difference. At the beginning of this post I promised to answer the question, “Is black a color?” (And if you skipped right down to here, then you are big cheater and shame on you.) The answer is, yes, black is a color. We have formally parameterized color as a 3D space with dimensions as mixtures of light, and black is sure enough in this space. We also talked about color as a space of hue, saturation, and brightness, and sure enough black is there when brightness is 0. There exist plenty of other color spaces that I’ve skipped over, such as CYMK, XYZ, Munsell, Luv, and Lab, and sure enough, every single one of them defines black as a color. In fact, it would be very difficult to formally define color without black. It would be like having a hole in space. There are several reasons why black is considered not a color. One common explanation is that black is the absence of light. Although this is principally true, the lack of activation in your eye’s light receptors is just as important a stimulus as lots of activation. In the end, saying black is not a color because it is the absence of light is roughly equivalent to saying cold is not a temperature because it is the absence of heat. I can assure you, I have been outside on a winter night. I saw a black sky and felt a temperature that was freakin’ cold. Another common reason for the misconception that black is not a color is confusing color with hue. Hue is not the same thing as color; it is just one of three dimensions of color. You cannot specify every color with only hue. Consider, for example, brown. Brown has the same hue as orange (but is darker and has less saturation). Are you willing to claim brown and orange are the same color? If not, then it really does not make sense to claim black is not a color. So rejoice. Black is a color. But if that’s all you see, I suggest you turn on a light before you run into a wall.